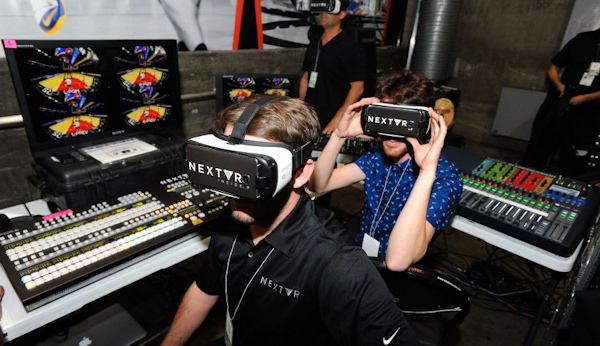 The NBA is partnering with virtual reality startup NextVR, which will be doing a lot of the production legwork, such as setting up a broadcasting truck outside the arena and filming the game. NextVR will work with NBA producers on how the game will be presented, and the NBA will have dedicated announcers and sideline reporters who will narrate the game. Since then, the NBA has privately experimented with “maybe around a dozen” more 360 broadcasts to learn how to make the games more compelling to viewers, according to Marsilio. During the first live broadcast, for example, the NBA discovered through tracking viewers that many people were not watching the whole game and seemed to lose interest as the game progressed. After more internal testing, the NBA learned that viewers would be more engaged in the VR broadcast and watch longer if more traditional broadcasting elements—like digital scoreboards, multiple camera angles, and replays—were added. “We got some seasoned production guys that’ve been telling us this from the beginning,” explains Marsilio. The NBA, essentially, had to “marry” what it learned from “decades of traditional broadcasting” with its more cutting-edge 360-degree live broadcast. The ultimate goal for the NBA is to move away from 360-degree broadcasts being “one-off events” and gradually introduce this type of broadcasts to the regular NBA schedule.